Posted September 15, 2016 by Shopping ForHealth & filed under News. Increasing evidence shows that what you drink is as important as what you eat. But with little guidance on what to sip, it’s no wonder that many children and adults choose high-calorie beverage that increase their daily intake of sugar. Some startling statistics: Half of all children and adults drink at least one sweetened beverage a day. And twenty percent of total daily energy intake is from beverages. Meanwhile, many people, especially older adults, don’t consume enough water or fluids each day. One study found that adults drink, on average, just over 1 liter of water each day, or about four eight-ounce servings. And, the total fluid intake from all beverages failed to meet guidelines from the Institute of Medicine for water consumption for 95 percent of men and 83 percent of women above the age of 70. The Institute of Medicine recommends consumption of 2 liters of fluids daily for women, and 3 liters for men. 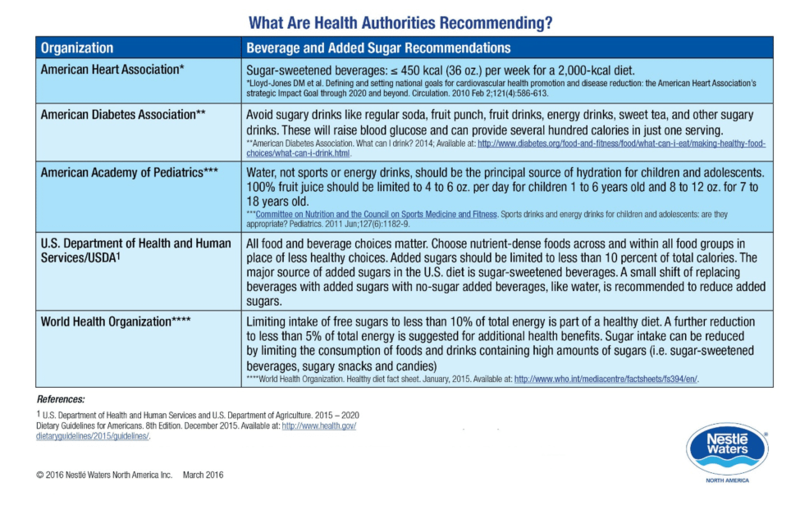 From Nestle Waters North America, here is a chart that summarizes recommendations from various health agencies on daily water and fluid consumption.